Even MORE [Creative] Ways We're Learning the Alphabet! There are just never too many fun new ways to explore the alphabet with our littles! A crazy amount of variety definitely isn't necessary, but switching it up sure makes learning through play even more fun; and that's exactly why I'm here today! Hello, Jenny's Crayons friends. I'm Denise. 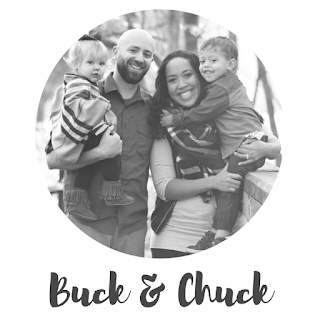 I'm a former teacher, turned coffee-addicted SAHM who now spends my days adventuring with and experimenting on my two favorite littles, Beckett and Charlie Grace, affectionally known as Buck and Chuck! 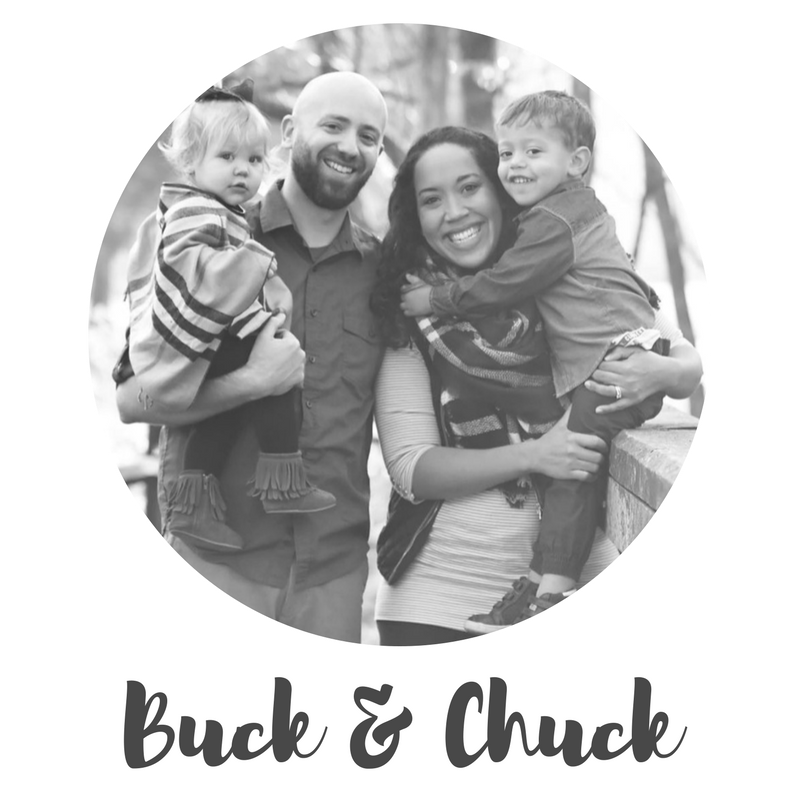 You can usually find us exploring, creating, and goofing off over at BuckAndChuck.com, but today Jenny invited me to share a few of our current favorite ALPHABET activities with you! Here's what you need to know! Nearly two years ago, I shared this post on 16 ways Beckett (19 months at the time) was learning his alphabet! Our methods were SUPER successful and Beckett knew ALL of his letters and sounds by the time he was TWO! Well now it's Charlie Grace who's hit 19 months and we figure it's about time we get started teaching her a thing or two. And since allll kids are exactly the same (right?!) we started out with the same methods! Boooy did I learn that that was NOT going to fly with this sassy pants, center of attention, terrifyingly decisive little miss. She wasn't having it and I knew that I was going to have to switch gears and get more creative (literally). So while we still do a little bit of our original 16 ways, here are some more colorful options for the "ar-teests" in your life! Here's an important tip for before you get started: model the activity and point out the letters. Maybe even help their little hands do the activity if they're interested. However, the goal here is PLAY! So if they just want to make a total chaotic mess, you're still WINNING! ALSO, I tend to focus on ONE letter at a time. So we play with ALL of the letters, just goofing and having fun, but I only ask Charlie to occasionally repeat whichever letter we're working on at the time. Keep it simple for them! 1. Let's talk about Play Doh. Does it REALLY ever get old?! Even when your children have stomped it into your carpet? I would be willing to spend EVERY nap time pulling colorful flecks of dried dough out of the floor if it meant my kids were happy and entertained in the morning. There is no losing with Play Doh. We got this set of cookie cutters a long time ago and we still use them almost every day! The shapes are usually our favorite, but we just recently started pulling out letters and VOILA. Insta-interest! Play Doh for the win! 2. OK. Remember how I just said there is no losing with Play Doh? Pretend for two seconds that I didn't say that and take a gander at the hot mess above on the right. This is borderline losing. You're at least going to lose that pile of dough and beads. I shared this on Instagram the other day because it was SUCH a #MomFail. PEOPLE: Those beads do not come back out! On the plus side, my kids were TOTALLY entertained, and we got to practice our B name and sounds. Going forward, though, we'll use marbles or wiggly eyes for this idea! 3. You need to know that this bright fun mess is every bit as appealing as it seems! Feathers and pom poms and neon chalk markers? OH MY! I just recently discovered these ERASABLE NEON Markers. WHAAAT?! My life is complete. Be careful though: they take a moment to dry. So if you're planning on doing several letters in a sitting, I would stick with good old fashioned chalk. PS. You can do this idea with just about any items on so many different surfaces! We've used hot wheels, plastic bugs and animals, legos, wiggly eyes, and just about any other small item we have around to layer over letters. You can draw your letters with chalk on the ground, with dry erase on a mirror or board, with a pen on paper, washi on the kitchen floor... the ideas are endless! 4. I've been wanting to try some sort of salt writing for a while now and I'm so glad I finally gave it a go! We saw ideas all over Pinterest for laying colors in the bottom of your salt tray and I just didn't have it in me to do ANYTHING extra. So VOILA! I grabbed a couple pieces of felt, threw it underneath a clear pie pan, and BOOM! Colorful bottom with no cutting, coloring, fitting, or arranging. You're welcome! We used epsom salts because I have a ginormous bag of it. This kept Charlie entertained for SO long. Unfortunately, clean up was more than I'd hoped (because I gave a 19 month old a slippery tray of salt), but my trusty Dust Buster took care of it! Next time we're feeling extra motivated, we're going to try this idea with shaving cream! 5. Have you seen this idea yet?! This brilliant stamping the Play Doh concept has been floating around the Pinterest-sphere for a while, but recently is the first time we gave it a try. When Beckett (the 3 year old) saw what I was doing, he responded as if I'd just done a crazy cool magic trick! There was so much excitement and oohing that I felt pretty dern accomplished! We used our Melissa and Doug Stamps, which worked perfectly for this! 6. Ok. Have you tried a scavenger hunt with your little yet? The first time we tried this was back for our Zoo Themed week, then we did it again with bugs. Beckett got such a kick out of the challenge that I decided to try it alphabet style! YOU NEED TO TRY THIS! Here's how it works: Scatter or hide a set of alphabet flash cards around the house/room, then send one kiddo (in our case, Charlie) to find them. Then let the other kiddo be responsible for the clip board and marker. As Charlie finds and brings the card back, we talk about the letter, then Beckett find and checks it off on our scavenger hunt sheet. SO FUN and so many great thinking skills! And SURPRISE! I've got a FREEBIE download for you! Just click here! Well how about it?! Did you find something simple, low-prep, low-mess that your kiddos would go gaga over? Playing and experimenting doesn't have to be earth-shattering to be memorable and fun! I hope you walk away today with a new motivation to explore the alphabet with your toddler or preschooler!